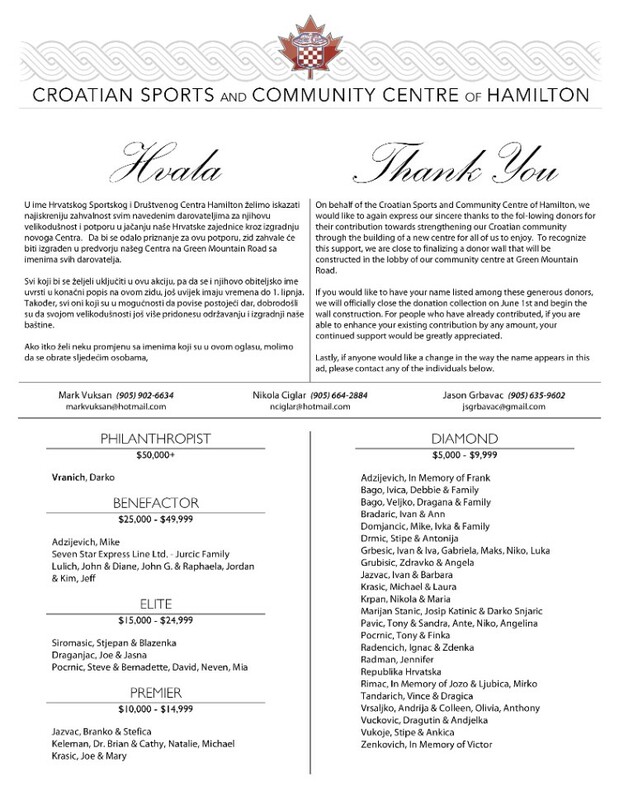 On behalf of the Croatian Sports and Community Centre of Hamilton, we would like to express our sincere thanks to every donor for their contribution towards strengthening our Croatian community through the building of a new centre for all of us to enjoy. 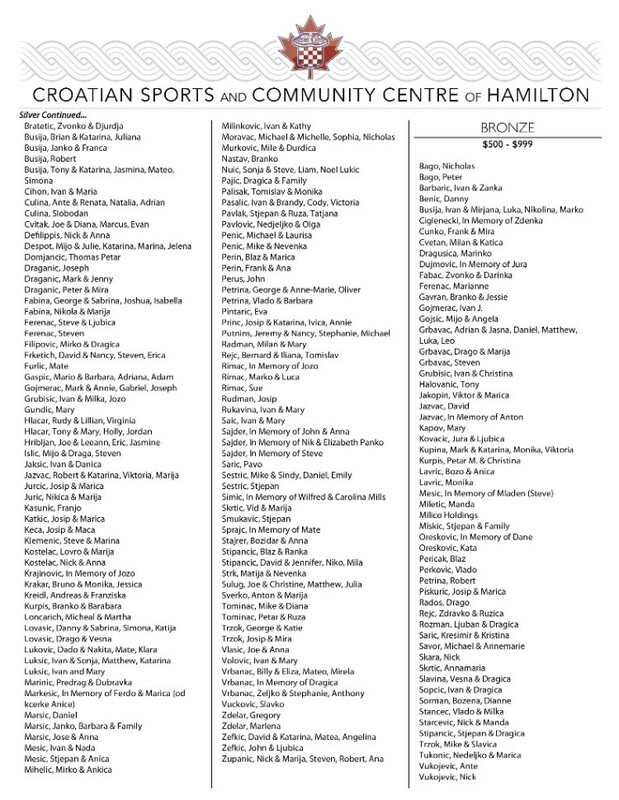 If you would like to have your name listed amongst our generous donors, there is still time before we finalize the recognition wall to be located in the lobby of the centre. Likewise, if you are able to enhance your existing contribution by any amount, the gesture would be greatly appreciated and leave a legacy of support for many years to come. To donate today, please contact any of following individuals. Or you can also donate using paypal! With every package below you will receive your name engraved on the wall that will encompass the front lobby of our new building. These names will always be there as a reminder of the generous donations of which our community has provided to support a place that stands for unity, brotherhood, culture, and togetherness. MAKE A DONATION TODAY AND HAVE YOUR FAMILY NAME LIVE ON FOREVER! Bronze Donation – $500 – Includes recognition of one single name. 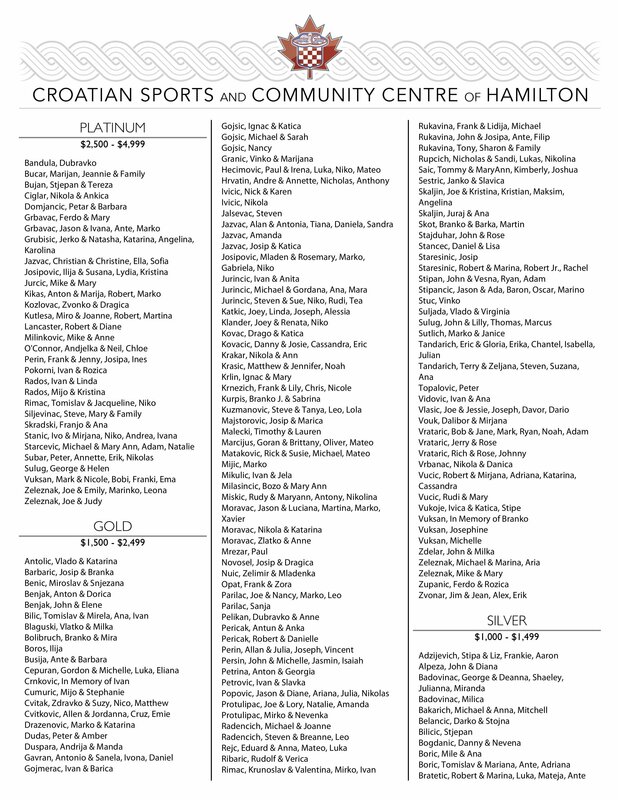 Silver Donations – $1000 – Includes recognition on the Donation Wall of your family surname, and first names of parent(s). Gold Donations – $1500 – This package (and higher) includes recognition on the Donation Wall of your family surname, and first names of parent(s) and any dependents under the age of 18. 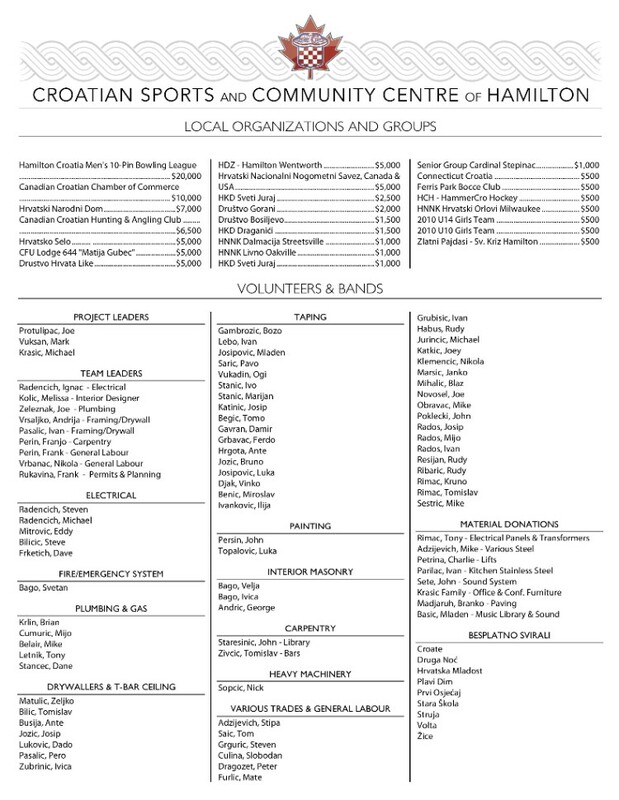 It will also include a lifetime membership to the Croatian Sports and Community Centre of Hamilton for the parents and children until the age of 18. 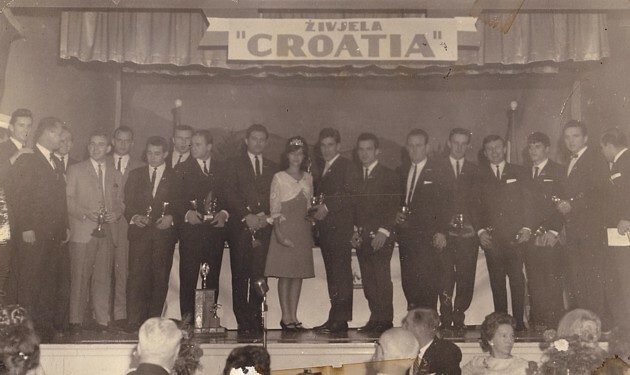 This is our chance to come together as a united community to preserve our Croatian culture, build on our success and leave a lasting legacy for future generations. Every contribution towards our fundraising goal is immensely appreciated. First off, again a huge THANK YOU to all of our very generous and committed members for their contributions to the building donation campaign and construction efforts. Below is the current list of donors that will inform the donor wall being constructed in our facility's lobby this summer. Please take a moment to review your family's information (click the images to open in a new window and zoom in) and let us know if there are any spelling mistakes, changes to your recognition, or edits to the amount (top ups). We are asking for this review by members no later than June 1, 2017 in order for us to build this donor wall. Please contact any one of Mark, Jason, or Nick ASAP for any changes you require. An email with the requested change and details would work best - markvuksan@hotmail.com; jsgrbavac@gmail.com; nciglar@hotmail.com.